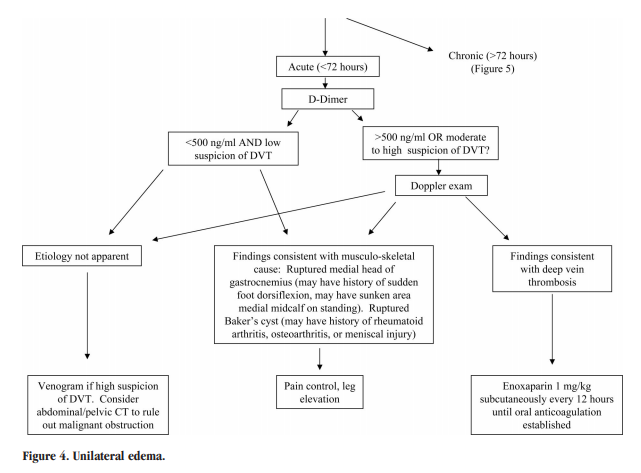 This post contains excerpts from Approach to Leg Edema of Unclear Etiology [PubMed Abstract] [Full Text HTML] [Full Text PDF]. J Am Board Fam Med. 2006 Mar-Apr;19(2):148-60. 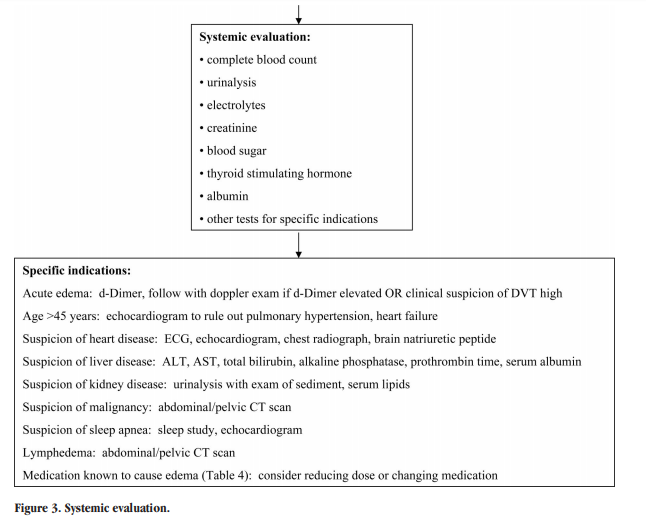 Please be sure and review the following article, (2) Edema: Diagnosis and Management [PubMed Abstract] [Full Text HTML] [Full Text PDF]. Am Fam Physician. 2013 Jul 15;88(2):102-10. The most common cause of leg edema in older adults is venous insufficiency. The most common cause in women between menarche and menopause is idiopathic edema, formerly known as “cyclic” edema. A common but under-recognized cause of edema is pulmonary hypertension, which is often associated with sleep apnea. Venous insufficiency is treated with leg elevation, compressive stockings, and sometimes diuretics. The initial treatment of idiopathic edema is spironolactone. Patients who have findings consistent with sleep apnea, such as daytime somnolence, loud [corrected] snoring, or neck circumference >17 inches, should be evaluated for pulmonary hypertension with an echocardiogram. If time is limited, the physician must decide whether the evaluation can be delayed until a later appointment (eg, an asymptomatic patient with chronic bilateral edema) or must be completed at the current visit (eg, a patient with dyspnea or a patient with acute edema [<72 hours]). 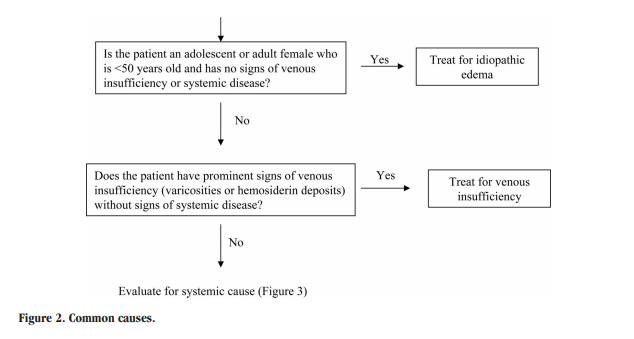 If the evaluation should be conducted at the current visit, the algorithm shown in Figure 1 could be used as a guide. If the full evaluation could wait for a subsequent visit, the patient should be examined briefly to rule out an obvious systemic cause and basic laboratory tests should be ordered for later review (complete blood count, urinalysis, electrolytes, creatinine, blood sugar, thyroid stimulating hormone, and albumin). the physician should first rule out lipidema (fat maldistribution with sparing of feet) and lymphedema (marked foot and toe involvement, verrucous thickened skin, nonpitting when chronic) because subsequent evaluation and treatment are different for these disorders. 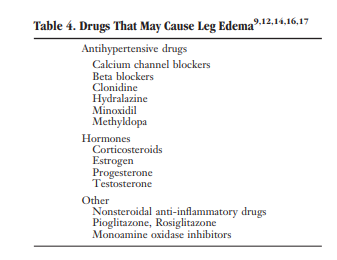 ● If systemic disease is considered unlikely, the most common causes of bilateral leg edema are idiopathic edema (in young women) and chronic venous insufficiency (in older patients). should consider the most common systemic causes (cardiac, renal, hepatic) and decide, based on history and physical examination, which of them need to be ruled out with further testing. Pulmonary hypertension is a common cause and should be suspected in patients who may have sleep apnea (eg, neck circumference 17 inches, loud snoring or apnea noted by sleep partner). ● If the patient presents with sudden onset (<72 hours) of leg swelling, a deep vein thrombosis should be ruled out using a Doppler examination. 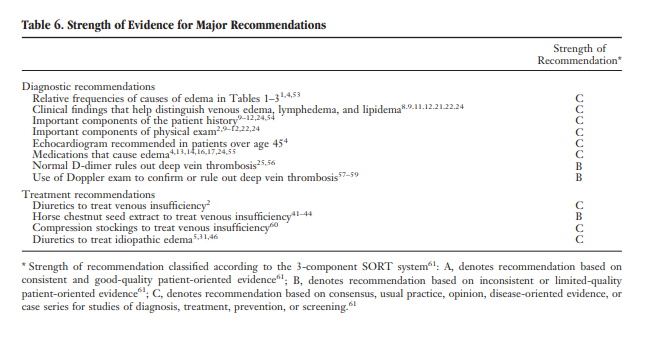 ● Evidence ratings for the major recommendations in this article are included in Table 6.
after a history and physical examination. However, there are at least 2 exceptions to this rule: pulmonary hypertension and early heart failure can both cause leg edema before they become clinically obvious in other ways. 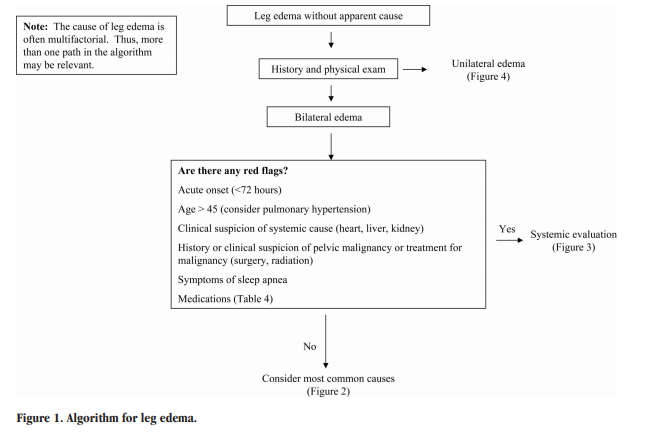 The differential diagnosis of edema is presented in Tables 1 through 3. Figures 1 through 5 provide an algorithm for diagnostic evaluation. 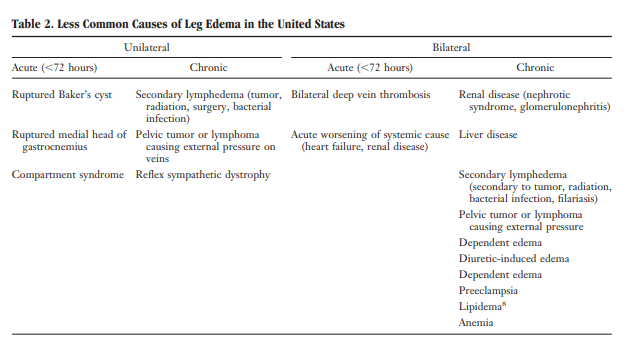 (1) Approach to Leg Edema of Unclear Etiology [PubMed Abstract] [Full Text HTML] [Full Text PDF]. J Am Board Fam Med. 2006 Mar-Apr;19(2):148-60. This article has been cited by 15 PubMed Central articles. (5) Lipedema: diagnostic and management challenges [PubMed Abstract] [Full Text HTML] [Full Text PDF]. Int J Womens Health. 2016 Aug 11;8:389-95. doi: 10.2147/IJWH.S106227. eCollection 2016. This entry was posted in Family Medicine, Internal Medicine, Medical Decision Making. Bookmark the permalink.